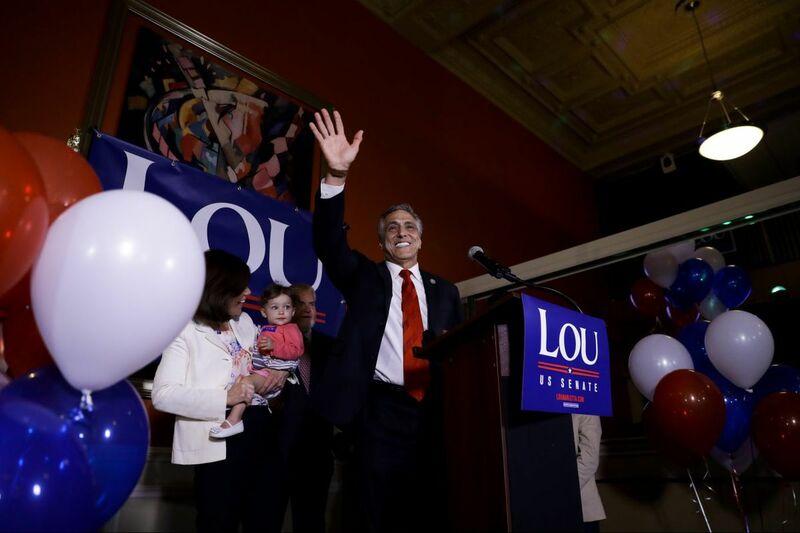 U.S. Rep. Lou Barletta, R-Pa., Republican primary candidate for U.S. Senate, gestures after talking to supporters during an election night results party, Tuesday, May 15, 2018, in Hazleton, Pa.
President Trump congratulated U.S. Rep. Lou Barletta on Wednesday after Barletta's win in the Pennsylvania Republican U.S. Senate primary race — though it's not the first time the president has thrown him support. After defeating State Rep. Jim Christiana of Beaver in Tuesday's primary, Barletta, a Trump ally, will appear on the ballot in November against incumbent two-term Democrat Sen. Bob Casey. "He will be a great Senator and will represent his people well — like they haven't been represented in many years," Trump said Wednesday morning on Twitter. "Lou is a friend of mine and a special guy, he will very much help MAKE AMERICA GREAT AGAIN!" Congratulations to Lou Barletta of Pennsylvania. He will be a great Senator and will represent his people well - like they haven’t been represented in many years. Lou is a friend of mine and a special guy, he will very much help MAKE AMERICA GREAT AGAIN! In response, Barletta thanked the president. "Just like you've never turned your back on the American people, I will never turn my back on Pennsylvania," he wrote. "Help is on the way in the Senate!" The shout-out came as no surprise — Barletta, a hard-liner on illegal immigration, was an early supporter of Trump and served on his transition team. The president was vocal about his support for Barletta back in February. Rep. Lou Barletta, a Great Republican from Pennsylvania who was one of my very earliest supporters, will make a FANTASTIC Senator. He is strong & smart, loves Pennsylvania & loves our Country! Voted for Tax Cuts, unlike Bob Casey, who listened to Tax Hikers Pelosi and Schumer! In October, Trump also called Barletta a "great guy" who will "win big" during a rally in Harrisburg. Barletta, who raised nearly $3 million to Christiana's $274,000 but spent little of it on the primary, won with 63 percent of the vote Tuesday.